Being possibly the only New Zealander ever to have sat (innocently) in an electric chair (in the Commonwealth of Virginia’s Corrections’ Penitentary in its capital, Richmond), I can say how abhorrent the continued practice of executions of convicted felons continues to be. Indeed, it was perverse then to watch the tour’s officer relax for the first time on the visit and to hear his tales of times past when things hadn’t quite gone as planned in the Old Dominon’s corrective, capital procedures. Leaning on the back of the tall ‘chair’ with hands clasped in a friendly fist, it was clear that the chair, the room and indeed the process all meant that a good family man could easily accommodate such cruel but not unusual punishment as 1,200 or whatever volts were being fired through a condemned prisoner’s head and limbs. I can recall being constrained to ask where the ‘death row’ of the penitentiary was in relation to his comments, only to be told that it was “just through the wall,” which gave good cause to suspect that its occupants would clearly have been within earshot of our group of University of Virginia School of Law masters’ students. That the end resolution of criminal behaviour ought to be an officially arranged death by such means is increasingly thought to be abhorrent in a Christian or other society. When the ceremony in front of friends and foe behind a glass wall shows its complete failure of process, punishment and potions with the condemned being forced to endure unspeakable agony before (and most likely after) the curtains had been pulled across that viewing glass [two weeks ago? ], the conduct of those armed with needles and vials calls for immediate examination. The prisoner defeated them all by eventually – and apparently – dying in his own way, by his heart simply but dramatically surrendering him to the hereafter. It was therefore simply wrong for the Oklahoma death row officials to stay the next man’s death until the chemicals had been recalibrated. Instead, it was the behaviour of those officials which was clearly ‘unusual’ as well as ‘cruel’ punishment and thus contrary to the United States Constitution – binding on both Virginia and Oklahoma. In that dedicated room of chemical misapplication, were they acting at the level if not of murder then surely manslaughter? Was their clear neglect of duty to follow their instructions’ manual, to honour their employer (the state of Oklahoma) and to protect their victim’s right always to enjoy that final distinction beyond ‘cruel and unusual’ punishment, which that Constitution had always afforded him: a death with dignity. That is what was clearly ‘unusual’ as well as ‘cruel’. 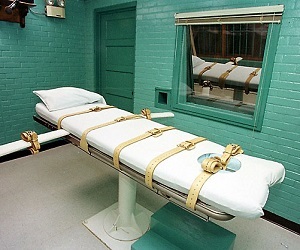 Were that chatty guard who allowed my classmates and me to try the Virginian chair for size, or those who caused or allowed last week’s poor or negligent preparation that last death in custody, called to account by a charge the execution agenda might have no willing helpers. If they had to face the very courts which had provided them with their objects of execution such as justified their very jobs when punishment for manslaughter might bring about a serious sentence on their uniformed official heads and, even more happily, a realisation that capital punishment is too expensive and difficult to organise not only when it comes to the chemicals, but to their own careers. At least in New Zealand by s.152 of our Crimes Act 1961, their neglect to have worked their chemical wonders might have amounted to a failure to have provided the ‘necessaries (of life) and protect from injury’ – a duty which applies to everyone who has actual care or charge of a person such as a condemned man who as a vulnerable adult and unable to provide himself. If an equivalent duty applied to the antics in the Oklahoma death cell, those officials would be under a legal duty to provide even that condemned person with such necessaries and to take reasonable steps to protect him from injury. And if the penalty were not a criminal conviction, but a judgement in damages, then the room would soon have been vacated before a sentence had been pronounced upon conviction. So, right up until the moment when the injection pierces the skin of the condemned or the electrical pulse enters the body tied down to prevent any alternative a prisoner is entitled to be protected by that Constitution and by our terms afforded s. 152’s ‘necessaries’ as would any other citizen have. Until that moment, the convict is entitled to protection against punishment which is cruel and unusual. Before that moment, there is duty at law. After that moment, the ‘law of punishments’ sanctions the withdrawal of the protections as long as the ‘treatment‘ is not cruel or unusual. In the Oklahoma situation, the procedures collapsed, the treatment became cruel and unusual – the withdrawal of the needle and/or the poison – the convict concerned was returned to the state of requiring the ‘necessaries’ of life a resumed status which was illustrated by the single and simple act of affording him privacy again by pulling of the curtain to shield him from the spectators’ view. No longer was it felt necessary for justice to be seen to be done because he was no longer going to be executed. At least not until they’d all got their chemical proportions right. And while they did, he apparently suffered a massive heart attack which could have come from the shock of the new – being dosed up as he was becoming – or the stress of imminent death so now apparent. And there was also talk of a stun gun having been used along the way. In any event from the time the vein couldn’t be found until the time of his heart failing him, he was once again entitled to the protection as our s.152 provides for. In part, he got it with the gain of privacy. Apart from the presence of those who’d messed up he went on to die in private. As with the friendly guard discussing procedures through the wall from death row prisoners it cannot be conducive to prison morale to have had last month’s Oklahoma state prison officials miss their mark by a fouled chemical mix. It would not be difficult to imagine the lawsuits in a country which runs on litigation if a prisoner fails to lose heart and survives to sue after having been tied to a gurney and clumsily delivered a miss-dose of the caring cocktail. Where the dose failed to ‘take’ the situation could be short of being either cruel or unusual, but instead would preserve the last of the prisoner’s dignity before departure occurs and give him some financial assistance to leave by the eye of the needle.